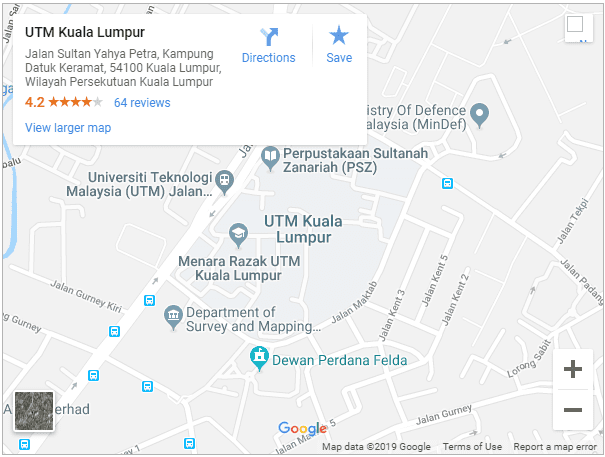 UTM KL is in its own local community affiliated with UTM, offers leading-edge programmes at bachelor and graduate degree levels and provides services both locally and internationally. In the current academic session, the UTM KL is offering full-time undergraduate programmes and postgraduate programmes under its four major schools: The UTM Razak School, The Perdana School, The Advanced Informatics School and the UTM International Business School. Some of these schools also offer part-time executive programmes for working professionals. In addition, part-time and modular programmes are run by UTMSPACE (The School for Professional and Continuing Education).